WHAT CORE VACCINES ARE RECOMMENDED FOR CATS? Rabies: This vaccine protects against rabies virus. This is a killed virus vaccine. After cat has kitten series and annual booster, both vaccinations are due EVERY 3 YEARS. 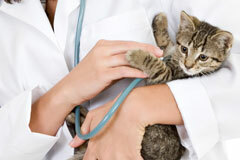 DOES YOUR INDOOR ONLY KITTY NEED VACCINES? The diseases in the FVRCP vaccine are spread through small particles that float in the air, and can also be carried into the house by people on clothing and footwear. These diseases are highly contagious. Once infected with FVR (herpes) virus, cats remain infected and clinical signs flare up when the cat is stressed. Therefore becomes a recurrent problem. Many indoor cats somehow manage occasionally to get outside...hence unexpected exposure. If your cat really never goes outside, risk of exposure to rabies is low. Discuss with your veterinarian rabies vaccination as recommendations vary depending on individual situations. Prevention of disease through vaccination is much more effective than treating disease after infection.